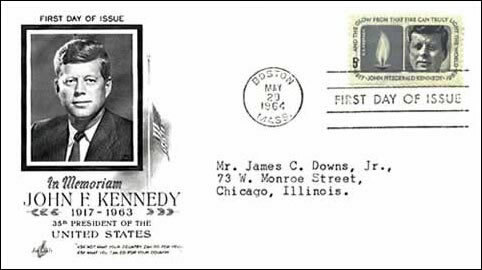 The Kennedy family chose Avanti designer Raymond Loewy to create the 1964 JFK Memorial Stamp. The Tuvalu stamp is one from a series named Leaders of the World. The elevations on the Avanti stamp are close, and the drawing of the white Avanti emphasizes the air intake under the bumper. The stamp with the Avanti beside a cage enclosing a spotted wild cat is from the Commonwealth of Dominica. The animal symbol was probably intended to suggest speed. 63 Studebaker Avanti on the Tuvalu Stamp. 63 Studebaker Avanti on the Dominica Stamp.